You can finish the title yourself. That’s really the key to the season for this edition of the Toronto Maple Leafs, though maybe not in the way you might think. Some things have changed to be sure. There are new faces on the ice in expanding roles. There were some surprising late cuts and of course, there are a lot of new bodies in the front office and on the coaching staff. But what does it all amount to? Is this Leafs team poised to make the jump from fringe playoff contender to dark horse conference contender? If not, just what is the point of all this? Let’s take a look at the team and see what there is to be seen. Nice number Brandon. No negative association there or anything. Like I said, there are new faces. 21 year old Josh Leivo had a cup of coffee with the team last season and didn’t look out of place; he also had a fantastic season for the AHL’s Toronto Marlies. He’ll be counted on to provide two-way play on the third line. Stuart Percy is another 21 year old, a former first round pick, and he’s oozing with talent. He’s made the team out of camp and looks to be a seventh defenceman at this point. However, his strong skating and positional play might quickly make him a favourite over some of the riskier options this team ices on the back end. The most interesting (read: surprising) player to make the team out of camp is 24 year old Brandon Kozun. A former member of the Canadian Junior Team, Kozun was a late round pick of the LA Kings in 2009 and came to Toronto last year in a mid-season swap of minor leaguers. He also clocks in at just 5’8 and 180 pounds, which will make it difficult for him to play anywhere but on the top two scoring lines for this team. It appears he’s been given that opportunity, as he’s skated with Nazem Kadri and Joffery Lupul for most of training camp. If Kozun can give the team speed and skill alongside that duo, he could be a diamond in the rough. Another addition is 37 year old veteran defenceman Stephane Robidas. A longtime warrior for the Dallas Stars, Robidas will be a welcome defensive addition to the team if he can recover from the broken leg that ended his year last season. Centre Mike Santorelli will provide third line depth and defenceman Roman Polak will provide a grittier option for a back end that was often too soft in its own zone last season. 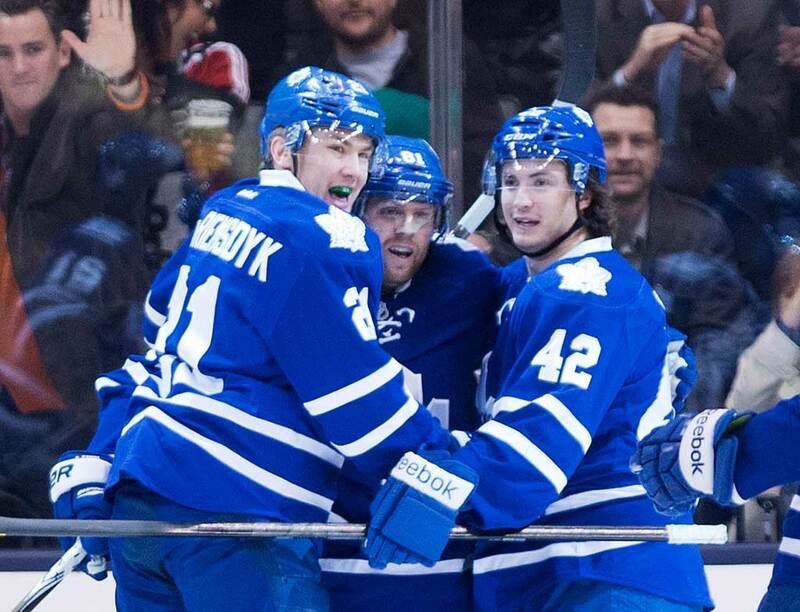 Will it be all smiles and hugs for the Leafs young core this season? Leo Komorov and Matt Frattin have also returned after one year absences. A depth forward during the team’s return to the playoffs in 2012-13, Komorov provides the kind of defensive play teams love to get from their bottom six. Frattin has plenty of speed and some skill, but has had a disappointing training camp. He made the team, but looks to be the odd man out of the forward combinations for now. Carter Ashton has played games the past two seasons for the team and the former first round pick finds himself on the fourth line to start the season. 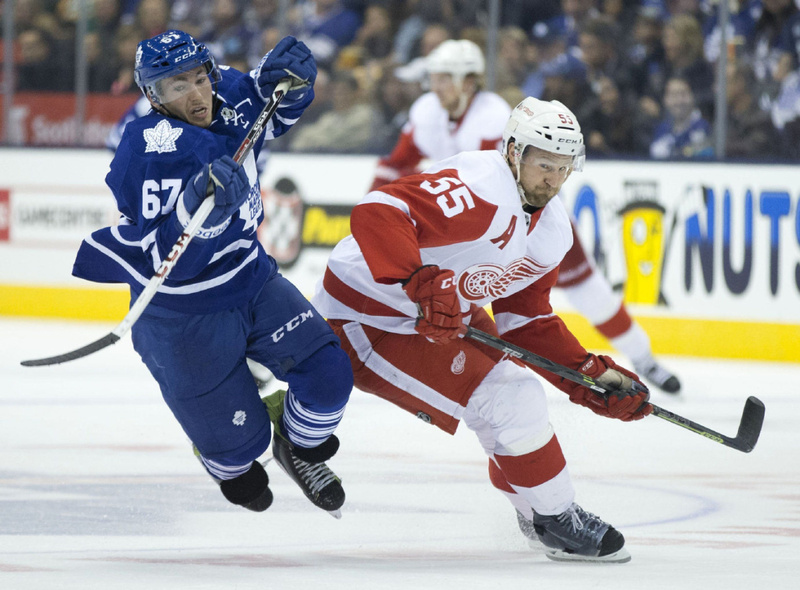 His size and grit will be needed, as the team somewhat surprisingly sent tough guys Colton Orr and Frazer McLaren to the AHL. On the back end, captain Dion Phaneuf is still the centrepiece of the defense but hopefully the additions of Robidas and Polak will help cut down his minutes. He’s also set to be paired with one or the other initially (Robidas tonight), giving him a stay-at home partner, which should help unshackle him offensively. I’ve said it before, Phaneuf would be an extremely effective d-man at 20-22 minutes per game. At 25 plus minutes, he’s too often gassed and forced into making poor decisions. You saw that taken into account by coaches last season, as his workload was dropped to just over 23 minutes per game, by far his lowest since joining Toronto. The continued development of young guns Morgan Rielly and Jake Gardiner will be the X-factor for the Leafs defense corps. Rielly projects to be All-Star eventually; the kind of all-around player that teams drool over. He’s a great skater with offensive skill and defensive smarts but he’s still only 21 and not quite there yet. Gardiner is more of the all-offense type – a brilliant puck mover who will need significant improvement just to be average in his own end. If these two can take a step forward this year, the defense, which also includes skilled behemoth Cody Franson, could be a surprising strength for the team this year. The man in the middle will be around next season. The guy on the right? Not so sure. BUT WHAT DOES IT ALL MEAN BASIL? What it means to me is that we’re in for an interesting season, a crossroads of sorts. 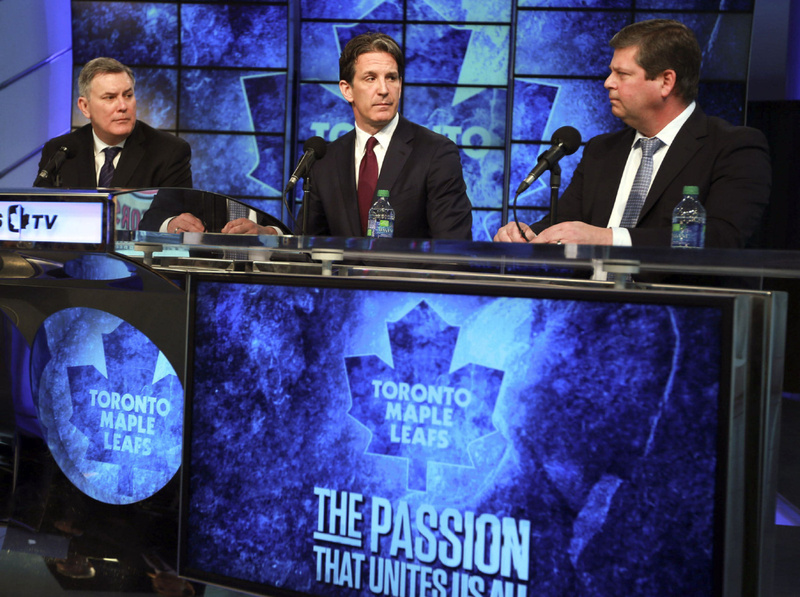 Under new team president Brendan Shanahan this Leafs team could have been stripped for parts. However, the massive contracts of Kessel and Phaneuf were already in place, an excellent young goaltender in Jonathan Bernier had just been acquired and the combination of youth and skill at the centre of the franchise are not just tenable – they’re enviable. This is almost definitely Randy Carlyle and Davis Nonis’ last kick at it. If the Leafs start slow, don’t be surprised if Carlyle, like his assistants before him, is fired mid-season. Short of the Leafs making a surprise appearance in the Eastern Conference Finals, I think he’ll be gone when the season ends regardless. Steve Spott coached the Marlies last year and is familiar with many of the Leafs’ current players. He’s by all accounts the anti-Carlyle – a players coach that gets along with people well. He’d be the bridge to next season if Carlyle gets the boot, when I still think this team is going to take a run at Red Wings head coach Mike Babcock, who is a free agent when the season is over. The Leafs are currently project to finish in the NHL’s no man’s land. Nobody would be surprised if they managed to finish anywhere from 6th to 8th and landed a playoff spot. Nobody would be surprised if they missed the playoffs again. The only surprises would be if everything imploded and they wound up near the bottom of the league, or if they somehow turned into a contender for the division title and a real playoff contender. Just like in every pro-sport, no mans land is a bad place to be, doubly so if you have no chance at improving. However, with the Leafs young core and the pieces they have in place, they still have that chance. It remains to be seen whether they’ll take that step this season, or if the roster needs to be radically reconfigured. Another year in no man’s land can’t be in the cards- hence, the crossroads. I think the Leafs will have enough improvement from their core to contend for a playoff spot, as long as Bernier stays healthy. I like the steps they’ve taken to improve their depth both in the bottom 6 forwards and on the blueline. It’s nice to see former first round picks like Rielly, Percy and Ashton actually cracking the lineup, forcing the Leafs to keep them in the fold despite their youth. That said, at this point, the steps have just been baby ones. I see them racking up between 90-95 points, but the majority of the improvement will need to come on the defensive end. They finished fourth in the East in goals scored last season but just 12th in goals allowed. They’ll probably be first round, or at best, second round fodder for a real contender, unless something clicks and they can forge a new identity. I’m not ruling it out, but the title says it all.